Riding a dirt bike in loose rocky terrain can be some of the most difficult terrain that you'll encounter. Many things can be done to help you be successful at this type of terrain, some deal with bike preparation, some with physical conditioning, and some with riding style and technique. Depending on what kind of dirt bike you are starting with, bike preparation will become more or less important. A dirt bike that was designed for off road use as opposed to a motocross bike will already be well suited to this type of terrain. The power will be more controllable and tend to keep the rear tire grabbing traction instead of breaking loose. If you are like me and are starting with a motocross style bike, or one with somewhat hyper power characteristics, then it's a good idea to try to mellow the power out a bit in order to gain control and keep the power hooking up instead of spinning the rear tire out of control. 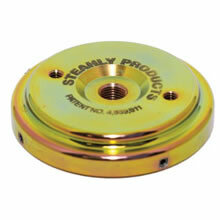 A great way to do this is to install a flywheel weight such as the pictured to the left. The install on these are as simple as removing the stock flywheel nut and replacing it with the weight. There are a few allen head locking nuts that need to be tightened down as well. These weights usually vary from 10 oz. to 14 oz. with 12 oz. being a happy medium. Another way to improve your dirt bike for this type of terrain is to install a rekluse automatic clutch these are a bit pricey, but are worth the price if you ride this type of terrain a lot. Anything to make the power smoother and to smooth out the transition from stop to go will help a bunch. It's hard enough trying to get started up a steep rocky hill without having to worry about the clutch! Experiment with different tire pressures, but don't go too low to avoid pinch flats. Lower pressure will allow the tire to conform to the rocks better and get more traction. Physical conditioning often gets overlooked by those that don't have to compete, as in motocross or enduro races, but if you have attempted one of these types of hills without paying some attention to physical conditioning you won't think twice about it next time. I've never been so out of breath and ready to throw in the towel as I've been nearing the top of a loose slippery climb on a dirt bike. Obviously there are many ways to approach this, but the most important thing is to have a routine that works for you to increase strength and cardiovascular endurance. The last thing that I mentioned was riding technique. You'll want to choose the smoothest line possible, unless of course you're wanting a greater challenge, but don't change directions too many times going up a hill as this will tend to decrease your forward momentum. Once forward momentum stops it's very hard to get it back and many times you will be faced with going back down to the bottom of the hill to start over. Chose a low enough gear to maintain a constant pace, but not so low that you are just spinning your tire and not carrying enough speed up the hill. I usually try 2nd gear with my hand on the clutch, or in my case now, I let my rekluse to the work. If you have a manual clutch, feather it as smoothly as possible. Keep standing and grip the dirt bike with your legs. Stay loose and keep your weight centered over the bike to keep your balance. You'll need to move your body around a lot to keep your balance so stay loose and remember, MOMENTUM! Stopping and getting going again usually takes more energy, so if at all possible, stay on the bike and keep moving forward. Don't use too much throttle, just smooth consistent throttle. If you get to a bigger rock, lean back a bit and grab a little more throttle to get over it. Don't be scared to charge the bigger rocks a little, the suspension will do more than you think sometimes, especially if you unload the front first by leaning back and use smooth throttle all the way through the obstacle. If you don't think you are going to make it, you usually won't. A consistent, committed pace is your friend. Finally, remember to practice, practice, practice! Your body learns as well as your mind, so the more you ride the stuff the better you'll be at it and you'll start doing things without even thinking. Thanks for the Info, I was planning on taking my bike up some rocky terrain next weekend and this is the exact info i was looking for.